During the many thousand years that human beings have been looking up at the stars, our concept of what the Universe looks like has changed dramatically. At one time, the magi and sages of the world believed that the Universe consisted of a flat Earth (or a square one, a zigarrut, etc.) surrounded by the Sun, the Moon, and the stars. Over time, ancient astronomers became aware that some stars did not move like the rest, and began to understand that these too were planets. In time, we also began to understand that the Earth was indeed round, and came up with rationalized explanations for the behavior of other celestial bodies. And by classical antiquity, scientists had formulated ideas on how the motion of the planets occurred, and how all the heavenly orbs fit together. This gave rise to the Geocentric model of the universe, a now-defunct model that explained how the Sun, Moon, and firmament circled around our planet. When it comes to understanding our place in the universe, few scientists have had more of an impact than Nicolaus Copernicus. The creator of the Copernican Model of the universe (aka. 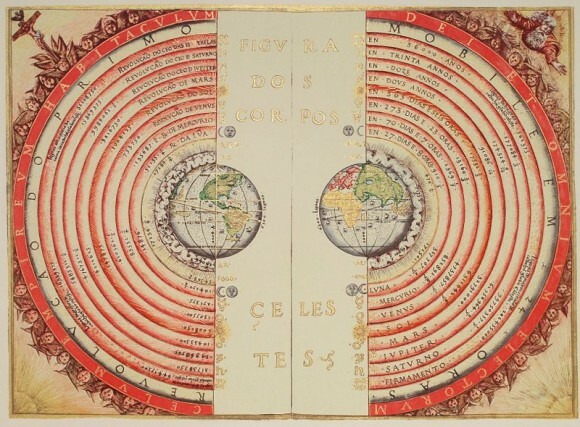 heliocentrism), his discovery that the Earth and other planets revolved the Sun triggered an intellectual revolution that would have far-reaching consequences. In addition to playing a major part in the Scientific Revolution of the 17th and 18th centuries, his ideas changed the way people looked at the heavens, the planets, and would have a profound influence over men like Johannes Kepler, Galileo Galilei, Sir Isaac Newton and many others. In short, the “Copernican Revolution” helped to usher in the era of modern science. 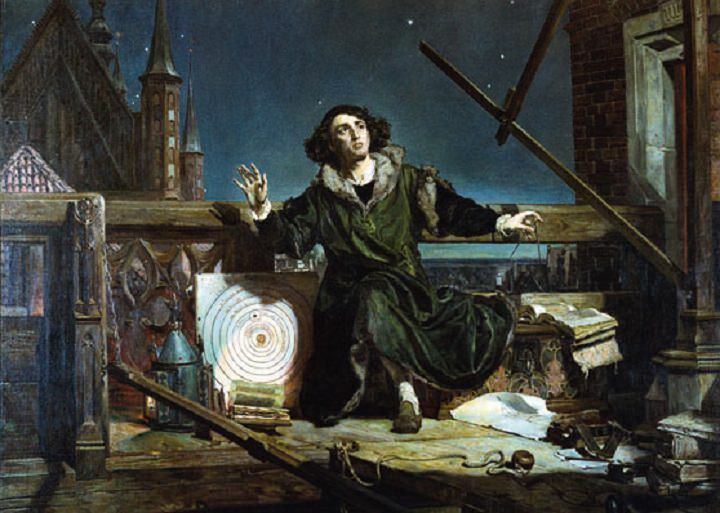 Copernicus was born on February 19th, 1473 in the city of Torun (Thorn) in the Crown of the Kingdom of Poland. The youngest of four children to a well-to-do merchant family, Copernicus and his siblings were raised in the Catholic faith and had many strong ties to the Church. His older brother Andreas would go on to become an Augustinian canon, while his sister, Barbara, became a Benedictine nun and (in her final years) the prioress of a convent. Only his sister Katharina ever married and had children, which Copernicus looked after until the day he died. Copernicus himself never married or had any children of his own. Born in a predominately Germanic city and province, Copernicus acquired fluency in both German and Polish at a young age, and would go on to learn Greek and Italian during the course of his education. Given that it was the language of academia in his time, as well as the Catholic Church and the Polish royal court, Copernicus also became fluent in Latin, which the majority of his surviving works are written in. In 1483, Copernicus’ father (whom he was named after) died, whereupon his maternal uncle, Lucas Watzenrode the Younger, began to oversee his education and career. Given the connections he maintained with Poland’s leading intellectual figures, Watzenrode would ensure that Copernicus had great deal of exposure to some of the intellectual figures of his time. Although little information on his early childhood is available, Copernicus’ biographers believe that his uncle sent him to St. John’ School in Torun, where he himself had been a master. Later, it is believed that he attended the Cathedral School at Wloclawek (located 60 km south-east Torun on the Vistula River), which prepared pupils for entrance to the University of Krakow – Watzenrode’s own Alma mater. In 1491, Copernicus began his studies in the Department of Arts at the University of Krakow. However, he quickly became fascinated by astronomy, thanks to his exposure to many contemporary philosophers who taught or were associated with the Krakow School of Mathematics and Astrology, which was in its heyday at the time. Copernicus’ studies provided him with a thorough grounding in mathematical-astronomical knowledge, as well as the philosophy and natural-science writings of Aristotle, Euclid, and various humanist writers. 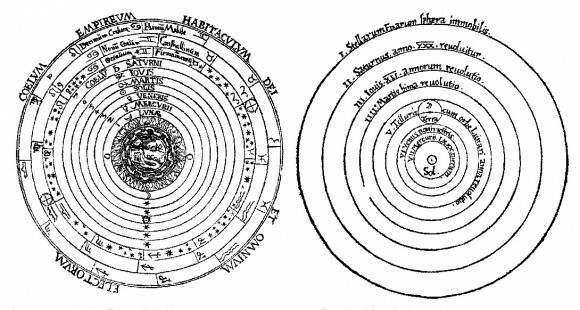 It was while at Krakow that Copernicus began collecting a large library on astronomy, and where he began his analysis of the logical contradictions in the two most popular systems of astronomy. 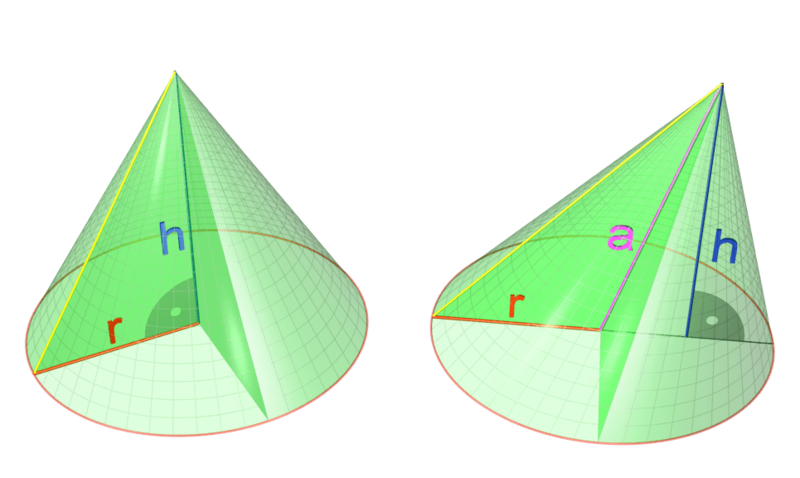 These models – Aristotle’s theory of homocentric spheres, and Ptolemy’s mechanism of eccentrics and epicycles – were both geocentric in nature. Consistent with classical astronomy and physics, they espoused that the Earth was at the center of the universe, and that the Sun, the Moon, the other planets, and the stars all revolved around it. Before earning a degree, Copernicus left Krakow (ca. 1495) to travel to the court of his uncle Watzenrode in Warmia, a province in northern Poland. Having been elevated to the position of Prince-Bishop of Warmia in 1489, his uncle sought to place Copernicus in the Warmia canonry. However, Copernicus’ installation was delayed, which prompted his uncle to send him and his brother to study in Italy to further their ecclesiastic careers. In 1497, Copernicus arrived in Bologna and began studying at the Bologna University of Jurists’. While there, he studied canon law, but devoted himself primarily to the study of the humanities and astronomy. It was also while at Bologna that he met the famous astronomer Domenico Maria Novara da Ferrara and became his disciple and assistant. Over time, Copernicus’ began to feel a growing sense of doubt towards the Aristotelian and Ptolemaic models of the universe. These included the problematic explanations arising from the inconsistent motion of the planets (i.e. 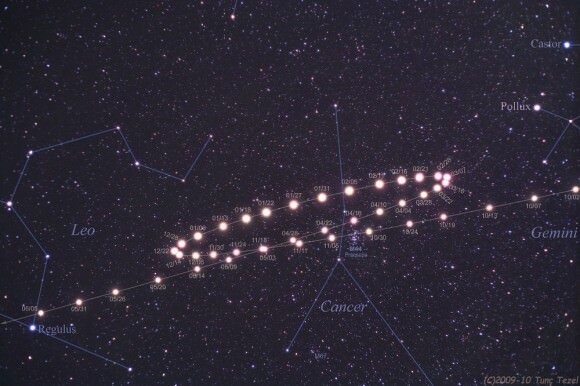 retrograde motion, equants, deferents and epicycles), and the fact that Mars and Jupiter appeared to be larger in the night sky at certain times than at others. Hoping to resolve this, Copernicus used his time at the university to study Greek and Latin authors (i.e. Pythagoras, Cicero, Pliny the Elder, Plutarch, Heraclides and Plato) as well as the fragments of historic information the university had on ancient astronomical, cosmological and calendar systems – which included other (predominantly Greek and Arab) heliocentric theories. In 1501, Copernicus moved to Padua, ostensibly to study medicine as part of his ecclesiastical career. Just as he had done at Bologna, Copernicus carried out his appointed studies, but remained committed to his own astronomical research. Between 1501 and 1503, he continued to study ancient Greek texts; and it is believed that it was at this time that his ideas for a new system of astronomy – whereby the Earth itself moved – finally crystallized. In 1503, having finally earned his doctorate in canon law, Copernicus returned to Warmia where he would spend the remaining 40 years of his life. By 1514, he began making his Commentariolus (“Little Commentary”) available for his friends to read. This forty-page manuscript described his ideas about the heliocentric hypothesis, which was based on seven general principles. These seven principles stated that: Celestial bodies do not all revolve around a single point; the center of Earth is the center of the lunar sphere—the orbit of the moon around Earth; all the spheres rotate around the Sun, which is near the center of the Universe; the distance between Earth and the Sun is an insignificant fraction of the distance from Earth and Sun to the stars, so parallax is not observed in the stars; the stars are immovable – their apparent daily motion is caused by the daily rotation of Earth; Earth is moved in a sphere around the Sun, causing the apparent annual migration of the Sun; Earth has more than one motion; and Earth’s orbital motion around the Sun causes the seeming reverse in direction of the motions of the planets. Towards the end of 1542, Copernicus suffered from a brain hemorrhage or stroke which left him paralyzed. On May 24th, 1543, he died at the age of 70 and was reportedly buried in the Frombork Cathedral in Frombork, Poland. It is said that on the day of his death, May 24th 1543 at the age of 70, he was presented with an advance copy of his book, which he smiled upon before passing away. In 2005, an archaeological team conducted a scan of the floor of Frombork Cathedral, declaring that they had found Copernicus’ remains. Afterwards, a forensic expert from the Polish Police Central Forensic Laboratory used the unearthed skull to reconstruct a face that closely resembled Copernicus’ features. The expert also determined that the skull belonged to a man who had died around age 70 – Copernicus’ age at the time of his death. These findings were backed up in 2008 when a comparative DNA analysis was made from both the remains and two hairs found in a book Copernicus was known to have owned (Calendarium Romanum Magnum, by Johannes Stoeffler). The DNA results were a match, proving that Copernicus’ body had indeed been found. On May 22nd, 2010, Copernicus was given a second funeral in a Mass led by Józef Kowalczyk, the former papal nuncio to Poland and newly named Primate of Poland. Copernicus’ remains were reburied in the same spot in Frombork Cathedral, and a black granite tombstone (shown above) now identifies him as the founder of the heliocentric theory and also a church canon. The tombstone bears a representation of Copernicus’ model of the solar system – a golden sun encircled by six of the planets. Despite his fears about his arguments producing scorn and controversy, the publication of his theories resulted in only mild condemnation from religious authorities. Over time, many religious scholars tried to argue against his model, using a combination of Biblical canon, Aristotelian philosophy, Ptolemaic astronomy, and then-accepted notions of physics to discredit the idea that the Earth itself would be capable of motion. However, within a few generation’s time, Copernicus’ theory became more widespread and accepted, and gained many influential defenders in the meantime. These included Galileo Galilei (1564-1642), who’s investigations of the heavens using the telescope allowed him to resolve what were seen at the time as flaws in the heliocentric model. These included the relative changes in the appearances of Mars and Jupiter when they are in opposition vs. conjunction to the Earth. Whereas they appear larger to the naked eye than Copernicus’ model suggested they should, Galileo proved that this is an illusion caused by the behavior of light at a distance, and can be resolved with a telescope. Through the use of the telescope, Galileo also discovered moons orbiting Jupiter, Sunspots, and the imperfections on the Moon’s surface, all of which helped to undermine the notion that the planets were perfect orbs, rather than planets similar to Earth. While Galileo’s advocacy of Copernicus’ theories resulted in his house arrest, others soon followed. Today, Copernicus is honored (along with Johannes Kepler) by the liturgical calendar of the Episcopal Church (USA) with a feast day on May 23rd. In 2009, the discoverers of chemical element 112 (which had previously been named ununbium) proposed that the International Union of Pure and Applied Chemistry rename it copernicum (Cn) – which they did in 2011. In 1973, on the 500th anniversary of his birthday, the Federal Republic of Germany (aka. West Germany) issued a 5 Mark silver coin (shown above) that bore Copernicus’ name and a representation of the heliocentric universe on one side. In August of 1972, the Copernicus – an Orbiting Astronomical Observatory created by NASA and the UK’s Science Research Council – was launched to conduct space-based observations. Originally designated OAO-3, the satellite was renamed in 1973 in time for the 500th anniversary of Copernicus’ birth. Operating until February of 1981, Copernicus proved to be the most successful of the OAO missions, providing extensive X-ray and ultraviolet information on stars and discovering several long-period pulsars. Two craters, one located on the Moon, the other on Mars, are named in Copernicus’ honor. The European Commission and the European Space Agency (ESA) is currently conducting the Copernicus Program. Formerly known as Global Monitoring for Environment and Security (GMES), this program aims at achieving an autonomous, multi-level operational Earth observatory. On February 19th, 2013, the world celebrated the 540th anniversary of Copernicus’ birthday. Even now, almost five and a half centuries later, he is considered one of the greatest astronomers and scientific minds that ever lived. In addition to revolutionizing the fields of physics, astronomy, and our very concept of the laws of motion, the tradition of modern science itself owes a great debt to this noble scholar who placed the truth above all else. Universe Today has many interesting articles on ancient astronomy, such as What is the Difference Between the Geocentric and Heliocentric Models of the Solar System. For more information, you should check out Nicolaus Copernicus, the biography of Nicolaus Copernicus, and Planetary Motion: The History of an Idea That Launched the Scientific Revolution. Astronomy Cast has an episode on Episode 338: Copernicus.